I have no idea how it took me so long to discover the Pittsburgh gem that is Cinco de Mayo Salsas, but one pleasant Saturday afternoon just as we were wrapping up our shopping at the Pittsburgh Public Market in the Strip District, I decided to take a peek at the back of the market where a large yellow sign on the wall proclaimed "Homemade Salsa Today." 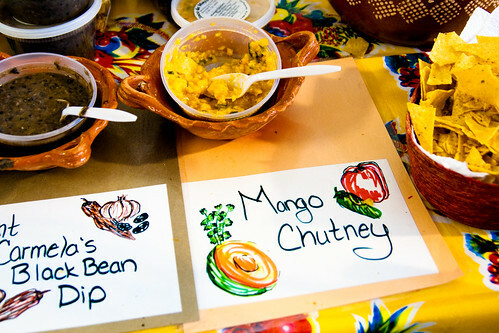 I am a huge fan of mangoes, which was why the Mango Chutney on the right end of the table drew my attention immediately. Just as I was about to reach for a sample, I overheard owner Arturo Vizzuett telling another customer that he had worked 17 hours the day before making the salsa. Sure enough, the mango chutney was fresh, and superbly delicious to boot! We proceeded to sample several other flavors as Arturo provided commentary on each. Arturo is quite the character. 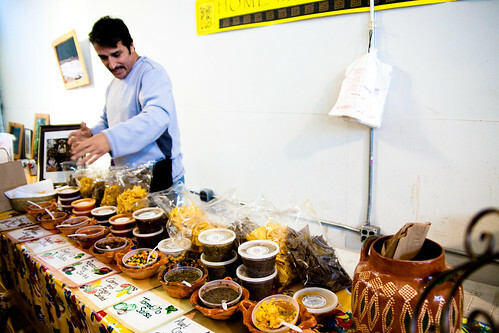 Originally from Mexico City, he makes his salsa the way his mother and grandmother did back in the day. 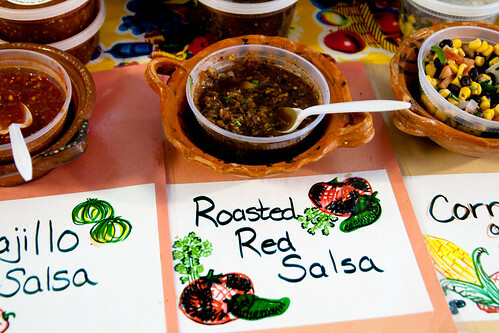 Since moving to the US, he has been selling his salsa on the street outside of Enrico's Biscotti in the Strip District for 16 years, as well as a number of farmer's markets in the area. He recently moved into the Pittsburgh Public Market and is only there on Saturdays, but he laments that many of his usual customers are not aware of his new location, so come January he may be moving back to his old spot on Penn Avenue. Talking to Arturo, you can't help but feel a strong sense of enthusiasm and passion for what he does, and he does it tremendously well. He explains that in Mexico, salsas are not used as a dip for tortilla chips; rather, they are used as a sauce for cooking. It was fascinating to hear him rattle off recipe after recipe after recipe using his salsas. I was sampling the very tasty Spanish Peanut Sauce, a concoction consisting of roasted tomatoes, roasted garlic, onions, roasted peanuts, smoked morita chili peppers, cumin, salt, water, and vegetable oil. The peppers give this salsa a little bit of a kick, though it is not terribly spicy, but what makes this sauce extraordinary is its smoky flavor that I'd imagine would be difficult to replicate in a typical home kitchen. Arturo explained that when he was a child, every time he smelled the Spanish Peanut Sauce at home, he knew he'd be having chicken for dinner. 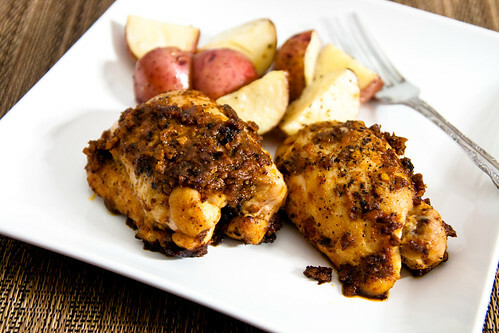 In a large skillet, brown chicken on both sides. Add the Spanish Peanut Sauce and the chosen liquid. The liquid is needed to thin the sauce, so watch and adjust the amount as needed. Then, lower heat and simmer for 20-25 minutes. Watch that the sauce doesn't burn; add liquid as necessary. Your house is guaranteed to smell delicious! That very night, I made this for dinner following Arturo's instructions, and let me tell ya, it was beyond amazing. In fact, the first thought that crossed my mind was that I wanted to go back right away to get more sauce. And then I remembered that Arturo is only at the Market on Saturdays, which meant I had a whole week to wait. Bummer! 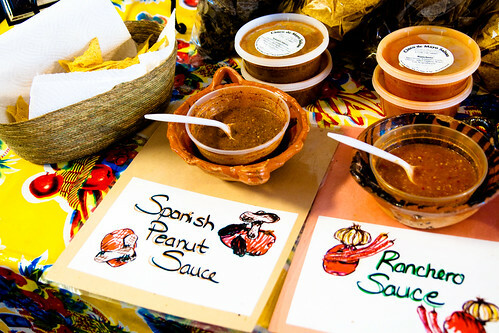 You bet I was back at the Cinco de Mayo Salsas booth the following Saturday for more Spanish Peanut Sauce. :) Methinks I'll be making this chicken again VERY soon.